RR-15 Rack Rider, Other Misc. Product from Furman. 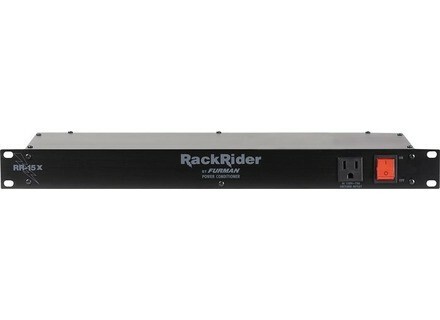 The Furman RR-15 Rack Rider is a simple power conditioner with some pretty standard features. I've used this power conditioner in a professional recording studio to power up a good amount of different outboard gear including microphones preamplifiers and compressor. It can however power up anything that requires a standard power configuration. The RR-15 has nine power inputs in total, with eight in the back and one in the front for easy access. It has a power cord that comes out of the back and plugs directly into the wall for power. There aren't any other characteristics with the RR-15 as it is a very simple power conditioner. Basically, once everything is plugged in and ready to go, this will do it's job without needing to make any changes or do anything else. It is simply a utility tool and should be treated as such. Having said this, the Furman RR-15 Rack Rider is a very good for what it does. I've never had any problems with it whatsoever as it has always done it's job and has never added noise to any of the modules sounds, which has been known to be a problem with things like this. I think that pretty much every power conditioner that I've owned has been made by Furman, although I don't own this one, it's just to say that I trust Furman and the products that they make. For years they have been putting out top notch power conditioners at reasonable prices, which is exactly what the Rack Rider is. While not the most readily available, I don't think I'd necessary recommend it over other Fumran power conditioner if you couldn't find one anyway. Having said this, the Furman RR-15 Rack Rider is a very solid piece of equipment, so if you come across one and are in need of a power conditioner, I wouldn't hesitate with this one.